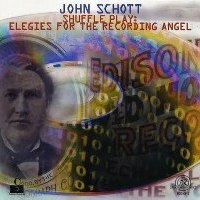 Hmmm, “Elegies For the Recording Angel” sounds familiar. Is that a quote from The Wire there in the title? Straight outta left field, way back by the bleachers, here we have a collection of year 2000 meditations on the mysterious (and nearly lost) realm of early recording history—featuring the ancient, tinny, scratchy sounds of various Edison wax cylinders from the late 19th and early 20th Century combined with contemporary instrumental music. Straight outta the Bay Area, the Ensemble Diglossia layers their considerable musical talents with these haunting, gritty textures of yore in a most “melding of the minds” kind of way. A wide array of “free-improvisation, musique concrete, post-war composition, AACM-derived strategies and pop-music” comes into play. Quirky improv, rocking marches, chaotic climaxes and plenty of haunting atmospheric ambience all abound. All aboard. You are currently browsing the archives for the John Schott category.